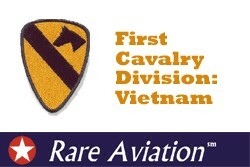 This is the story of the First Cavalry and their new helicopter airmobile mission in Vietnam. It covers everything from their initial training in Ft. Benning to deployment and rapid base setup in Vietnam. The B&W film shows great footage of the First Cavalry in combat operations. We get a chance to ride with the soldiers and experience their lives, first hand. The 11th Air Assault Division is covered in detail. We see their first base at An Khe. It is interesting to watch how the base was built and protected. We also see footage of the L-19 Birddog and C-130 flying off the base as well. The neighboring areas within easy reach of their UH-1 Iroquois Huey Helicopters included Pleiku, Plei Me, Tuy Hoa, Nha Trang and Bong Son. These brave Vietnam helicopter pilots and crews faced strong enemy force. The film covers the fly and spray tactics of the First Cavalry forces to locate and identify enemy positions. Operations in October and November, 1965 are shown. These engagements proved how valuable the helicopter was for battle in Vietnam. Helicopters delivered everything from cargo, howitzers, troops, food and wounded, and in record time. The Huey was also a great platform for aerial command centers. The baptism by fire gave these troops experience for the Pleiku campaign. The film covers this action in detail. The Plei Me attack was the beginning of this action. The First Cavalry was called to the rescue to secure a landing zone, LZ Field Goal. Footage of General Westmoreland is shown as he meets the troops. Footage of the conflict along the Tae River is covered with the fantastic support from the First Cavalry helicopter operations. LZ X-Ray was a clearing in the heart of enemy country. The First Cavalry landed a battalion of sky troops at X-Ray and they are shown immediately involved in an aggressive battle. The sky troopers turn the tide and the enemy losses were high. We see footage of B-52s drooping bombs while an F-105 Thunderchief flies cover. The sky troops head for LZ Albany and LZ Columbus. A surprise fierce firefight ensues. The large collection of captured weapons is shown. Piles of dead enemy soldiers are seen along the trail. Long flights of First Cavalry helicopters are shown in landing formation. Impressive. In 1966 the First Cavalry turned its attention to Bong Son. Rockets and automatic weapons are shown clearing landing zones. The second half of the film shows us more operations of the First Cavalry Division Airmobile, including Khe Sanh. This film is loaded with large amounts of actual UH-1 Huey flying footage. In NTSC DVD format with a run time of 29 minutes. Packaged in either a clear plastic CD-style jewel case or a clear plastic C-Shell DVD case without paper graphics.